Recently, I was in a meeting of government communicators at the leading edge. The discussion was informed, and mature; the examples innovative and and impactful. Though the group had diverse backgrounds in Press Offices and Strategic Marketing, they were all in agreement that digital, and social media in particular, was the way of the future. This happens a lot. For people looking to do more for less, digital offers a more cost-effective delivery channel. For people looking to reach younger or more mobile audiences, it offers new and engaging channels. For people looking to innovate, it offers exciting tools and techniques. All of this is possible, and I’d argue, desirable. But if we’re going to make it happen on the scale people envisage, we need to translate that enthusiasm into a deliverable configuration of people, suppliers and skills. And to do that, we need to unpack what digital means in the context of government. Brian Hoadley kicked this off for me with a great post unpacking two contrasting approaches to social media: as a one-off campaign tool vs an enduring set of communities. In my mind, it’s also the difference between the digital marketing approach to social media, compared to the digital engagement or channel management approaches. 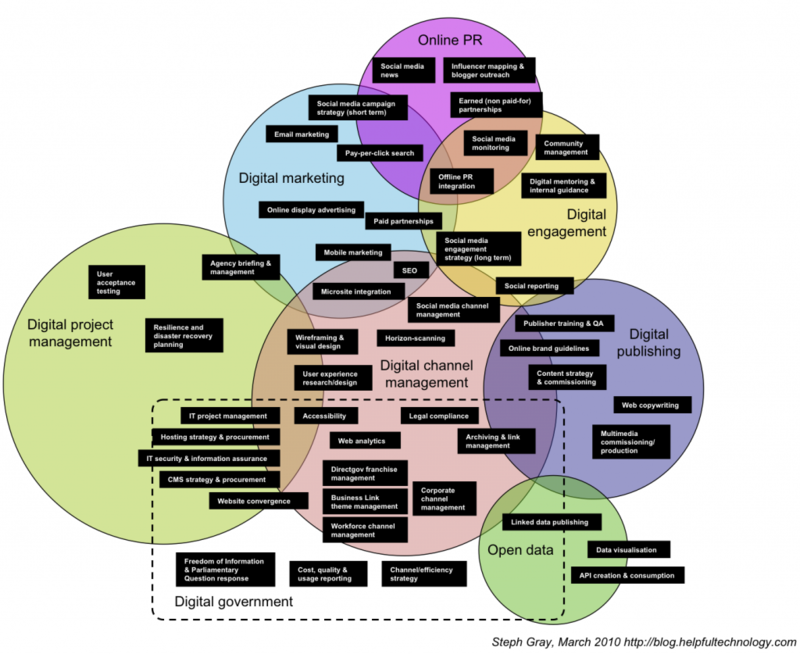 Digital needs go-betweens: just look at the overlaps. In a day’s work, webbies find themselves in discussions with IT, PR and digital agencies, lawyers, photographers, data geeks, half-trained web publishers and vocal online communities. It’s not just a technical or communications discipline: the old cliché of webbies being from IT, or more controversially being just a branch of Marketing, doesn’t bear out. It’s obvious from the scope of the work mapped out there that there will be tensions with people who see the aspects of digital that relate to Marketing, but can’t relate to the IT project management aspects; or who can relate to copywriting, but not user experience analysis or channel strategy. It’s demands a diverse team: the most important conclusion from this thought experiment is that government digital work is now such a vast, diverse and yet professionally specialised field, that we need to rethink who does digital. Either we radically scale up the late 1990s concept of a ‘web team’ from a primarily publishing operation to some much more sophisticated (you could easily see a Head of… each of the groupings above within much bigger digital operations). Or, someone needs to do a whole lot more engagement with people elsewhere in the organisation who work in parallel fields (IT service operations, offline marketing, training, internal comms, statistics etc) to help them become professional specialists in some of these fields themselves (of course, there are external agencies that offer many of these services, but they still need intelligent clients to work with). So perhaps that’s the biggest challenge for government in using digital more effectively to listen, discuss, inform and deliver. Somehow, we need to find ways to increase skills and capacity across this enormous field. How on earth are we going to achieve that? none of this is gonna happen until digitalbritain has ubiquitous connectivity. Currently half the country have little or no broadband access. Keep making your plans for that great day, but don’t hold your breath. At the ftth conference in Lisbon this week the UK has dropped further behind and is now a laughing stock amongst other forward thinking nations. Just sayin. I was wondering about where digital inclusion and infrastructure fit. They’re clearly policy questions so I left them off my monster venn diagram, but maybe there’s point missing under digital engagement or digital marketing that relates to the area of planning digital activity in the context of audience access and capabilities? … so yes, on your monster venn diagram build another load of apps for those who will be on dial up for another decade or three. This is a great list – but I think there is a an entire category you may be missing: digital service delivery. For my money, one of the more revolutionary things going on at the moment is the subversion of the old world order where, to put it far too crudely, there was a chasm between marketing and communications on one side and service delivery on the other. That made a sort of sense when the first was a leaflet and the second was a phone call. It makes no sense at all when they are both part of a single customer experience. – white label development and integration. That turns our to make ten without trying, so we get to 57 after all. All of which means that the question you end with is still more difficult and still more important. I think we will see a time when it forces some big organisational restructuring, but we are not yet close to the time when the question is understood, let alone the answer, so for some time yet we are going to have to find ways of making all this work despite the structures as much as because of them. Hi, Just discovered your blog via Tony Molloy on Friendfeed. I spent 6 years running a ‘web team’ within the European Commission. I think there’s no way a typical government dept will be able to scale up their teams to handle the incredible diversity of roles that such a team needs today, so the only credible role is to, as you put it “do a whole lot more engagement with people elsewhere in the organisation”. However, this can’t be limited to “parallel fields” like IT service operations – any internet-oriented communications projects, and particularly social media ones, will need to engage internally with “orthogonal fields” – e.g., policy development. After all, if a gov’t online community manager has to be “the voice of the community within the organisation” (cf Connie Bensen), then people in the organisation need to listen to what he/she relates to them, if the community is to take the engagement seriously. And this is a pretty massive shift for the lawyers and engineers who dominate the civil service, and for whom the internet is a “techie comms thing”. The UK government seems ahead of most in this, so has anyone you know collected together a toolkit of internal marketing materials that can help support this organisational change? @Stefan Thanks for the comment – I think I am indeed approaching this with too Comms-y a world view, and there is probably a missing circle for Digital Service Delivery as you say. I suspect if we worked out what we both mean by some of our labels, there might not be as many as ten new ones… although online customer relationship management has just popped into my head as something which often falls into the digital realm, but isn’t really accounted for here or in your list as I understand it. I think the diagram might benefit from hinting around the edges at the ecosystem it fits into, e.g. offline communications, policy development, IT operations, service delivery and so on. You’re right to point out that modern service delivery isn’t isolated from communications and marketing. It’s not workable of course to try and expand the digital realm to encompass the whole customer interface with the organisation – but I think in future, having a deep insight into the customer journey through our services *and the pain points at which digital can support it or make it more efficient* is going to be critically important. I really don’t know who within organisations is doing that at the moment, and as your post from a few weeks ago about a colleague’s efforts to get a minor change made to a transactional interface highlighted, it’s not easy to do. Naively, I have the impression it’s something more easily and more frequently done in the private sector, but I suspect I’m wrong. The article seems to take what there is now, and make it more difficult still. If you were in Malawi, the approach might be different. One might start by asking, what do people want from their government ? As the BBC has found, this is profoundly different at the end of a boom, to the beginning and middle bonanza. Likewise with all of the activity here. What is it adding to the citizen ? and ask users and citizens and SMEs to re-design and simplify it on the web. However, this is not going to happen quickly. It might also take a brave government official to recognise that it is individuals who can change, and that their relationship with the state needs to be altered so that the ability to control their lives is back with the individual. Vendor Relationship Management, authentication and identity will help to drive this in the next few years. So this is a plea to keep it simple, please. Let’s all try doing something with outcomes rather than more talk and words. As per our Twitter conversation, I love this post and can see myself linking and referring back to it many times. @Alex – I’m not so sure that a customer-centric approach would result in any fewer disciplines or a less complex relationship between them. The diagram might end up looking the same. I’d say that in order to meet users’ needs better, we need to be honest with ourselves about how sophisticated and multi-disciplined the work is and think about where these roles are best placed. Which needn’t mean more civil servants; it might even mean fewer in the long run. Great article which has really helped clarify some of my emerging thinking. I agree with Stefan that there is a whole digital delivery strand alongside this. Alex’s and Neil’s comments made me wonder if there is a digital transformation strand as well but I think that is better placed as a core challenge in each of these areas as well as an overarching strategic goal. When I saw the coloured circles I thought this was going to be too complicated. Then I read the job descriptions/activity buckets and realised how useful this is. Stuff I do falls into at least 6 of the 8 buckets. I love doing it all, but sometimes I feel like I’m spread too thin to have enough impact in each bucket. Goodness me, are you dreaming in 3d as well?! A lot of detail here to think about and some great thoughts from others on the challenges it all brings. I tend to agree with the prevailing view that this anticipates big organisational / cultural change in the future – and that we aren’t close to being at the point yet where this might become a reality. Steph, this is awesome thanks so much. Something which will prove most useful at my place of employment. I’ll be gesticulating and nodding at that super-Venn diagram for some time to come. Maybe there is hope yet for some meaningful segmentation in digital government! I am preparing for an interview (UK gov webbie post) and there’s a lot of ground to cover. I thought I’d read your recent posts and I can’t tell you how gratifying it is to see your (not exhaustive, i know) list of disciplines in which we have to be at least proficient in if not expert. I feel a lot better about myself now! Thanks for encapsulating the many realms we venture into and engage with, plus the expertise we absorb and share a long the way. Steph – this is so helpful in seeing the bigger picture of digital across government but also in itemising the various elements. Just writing my work plan for next year so good timing! When the website costs report comes out, it’s important that commentators understand all the behind the scenes work that goes into a web presence, not just the front-end design and content. 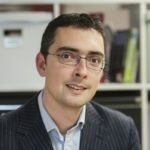 @Socitm Blog post on scope of ‘digital’ by @lesteph http://bit.ly/bZdPCE – interesting with regard to discussions on #pswp skills framework.